In the image above, the broad floodplain of Tres Alamos Wash runs from near lower-right to mid-left foreground, then bends sharply rightward against the high terrace which slants across the photo from above-mid-left to the upper center of our view. (This terrace formation dates from the time of the St. David Formation Lake of the Pliocene period). The constriction of the valley may be seen at this point, where the terrace on the east side of the river reaches down toward those on the west. At the far lower end of the terrace, you can see a short horizontal strip of pale green, marking irrigated farmlands and buildings located on the San Pedro River floodplain. (A Hohokam ruin is located near this confluence.) 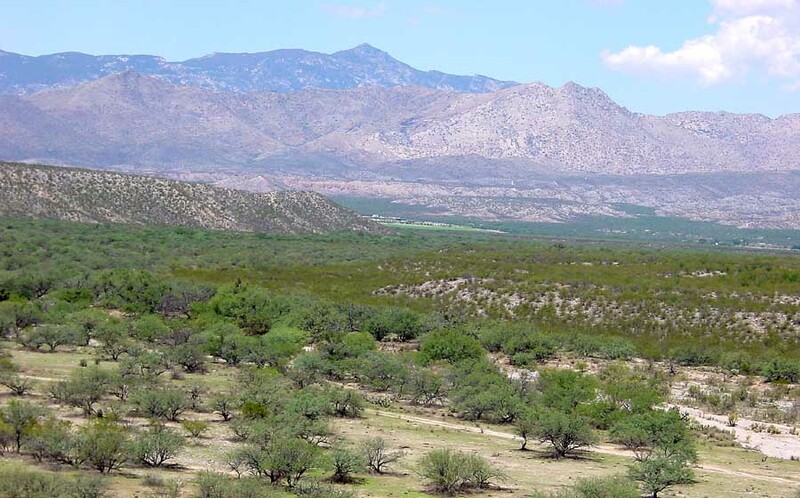 Across the valley, counterpart near-horizontal-appearing Pliocene terraces are visible, with the Little Rincon Mountains above them and Rincon Peak rising further behind. The bajadas there have remained part of the prehistoric Apache Highlands Grasslands. Just upstream from and out of view to the left of the Pliocene terrace formation at mid-left, Ash Creek runs into the San Pedro from its source in Happy Valley beneath Rincon Peak. The map below shows the location of the confluence. These two converging washes point to a typical feature of the entire valley: essentially, the whole area is a criss-cross of wildlife corridors - routes by which plant and animal species may move from one "sky-island" mountain range and its foothills to another, thus maintaining numbers and genetic diversity. 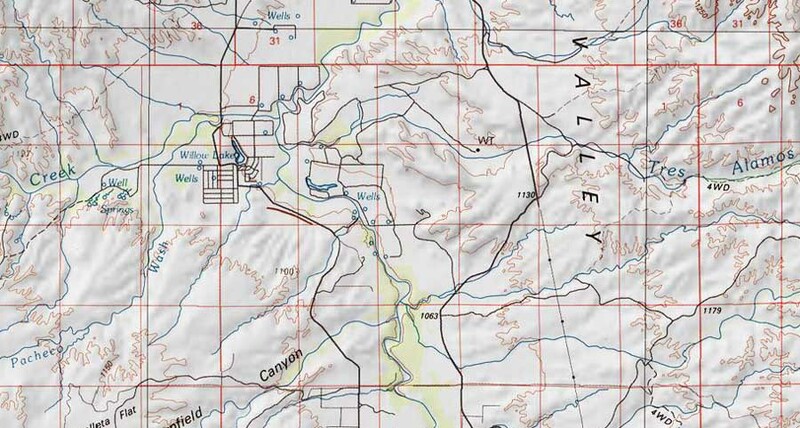 From this point northward along the river, these corridors are multiple and connect both the Catalina and the Rincon Mountains on the west to both the Galiuro and the Winchester Mountains on the east. Many of these washes contain springs, permanent streams in their upper reaches, including populations of fish, and mountain lions and bears purposefully walk down some of these washes following pools of water on their way to the river and beyond.